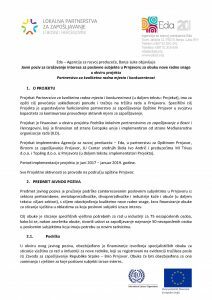 Within the project „Partnership for quality jobs and competitiveness“, public call for expression of interest for companies in Prnjavor regarding training of new employees was published. Subject of the public call is providing support to interested companies in Prnjavor from metal and wood processing sectors and food, leather and footwear production to obtain new workforce with adequate skills, through financing training for skills acquisition in those areas for which companies express their interest. The deadline for submitting applications is 30 October 2017 and more information on applying is available in the public call which can be downloaded here.